is the theme at Gothic arches this week brought to us by the very talented Dawn Bryson. 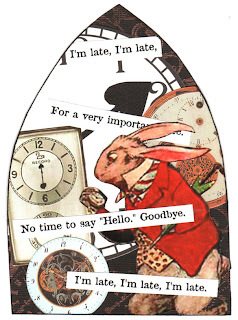 Whenever I here a theme of time I tend to think of the quote in the arch and the White Rabbit as he stares at his fob watch. I remember the quote too as I used to say it as a child whenever I was late getting home from being outside playing. Funny, that just popped into my head. But, I have never read the book! But I have a couple of friends to thank for a very late interest in it. Unfortunately I will probably never have the time to read it now. Okay, I just so you know, when I clicked on this I said wooo, outloud. That is a good thing...lol I love the bold black and white, the red in the rabbit, is just great, It's really cool! Oh, this brought back memories!! My Dad used to say this to us as he stood by the door waiting for us to get ready! There is such a frantic sense to it, isn't there? You've actually captured it so well in your piece, M-B. Oh, this is adorable! Very nicely done. What a great take on the theme,Mary-Beth, lots of different ideas on the time theme this week! Wow this is too cute for words! I love it!! Your time arch is just perfect Mary-Beth = Love it! Great time arch Mary-Beth!!! love the image! The energy in this piece is amazing and really portrays the snetiment, great arch! Amazing ! I love the way you have got the feeling of the rabbit rushing off somewhere ! Gorgeous arch ! This is brilliant! I love the White Rabbit best of all in 'Alice'!! Great way to depict the time theme!! PS - Any chance of you getting rid of word verification?!! Wow, You used almost same image! !Great idea ;) I love Alice in Wonderland and that rabbit is just fab. Lovely arch and so original. I love Alice Art! I so loved Alice in Wonderland as a child and I LOVE your arch..Beautiful..
Great images and design! I have an old copy of Alice that was my mom's - it's one of my most treasured books.